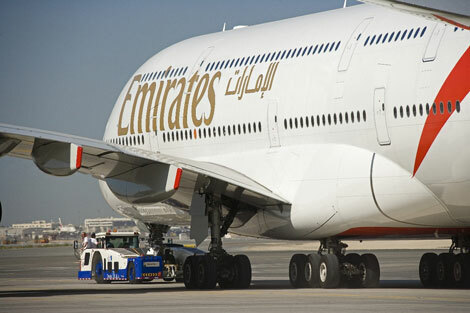 Dubai-based Emirates has ordered a further 32 Airbus A380s, taking its total orders for the superjumbo to 90 aircraft, or nearly 40 per cent of worldwide orders for the A380. This latest order, which has a list price of US$11.5 billion, was signed today (June 8) at the Berlin Air Show. According to Airbus the aircraft manufacturer now has 234 firm orders for the A380 from 17 customers, with Emirates alone accounting for 90 superjumbo orders, or just under 40 per cent of the worldwide total. Emirates says it is now the second largest airline in the world in available seat kilometres, and adds that in addition to the orders placed today, the carrier has 48 Airbus A380s, 70 Airbus A350s, 18 Boeing 777-300ERs and 7 Boeing air freighters on order totalling 143 wide-body aircraft worth more than US$48 billion. The airline took delivery of its tenth A380 on June 7, and currently serves eight destinations with the superjumb – London Heathrow, Toronto, Paris, Jeddah, Bangkok, Seoul, Sydney and Auckland. Beijing will be added to the list on August 1, followed by Manchester on September 1, and the return of the A380 on the New York route from October 1. For more information visit emirates.com, and for a for a look at the layout of the A380 aircraft operated by Singapore Airlines, Emirates, Qantas, Air France and Lufthansa, click here.